In the light of the growing political uncertainties in Nigeria, the only action that will attract absolute support and loyalty of Biafrans to the thirty three Senators representing all the senatorial districts within the Biafran territory at the moment, is to courageously stand up against the odds, synergize, sponsor and move a motion for Biafra referendum on the floor of the Nigerian Senate. This of course will be replicated in the House of Representatives as it remains the collective will and desire of the people whom they claim to be representing in the parliament. This demand is clearly supported by section 8 of the Nigerian Constitution of 1999 as amended. It stipulates that any demand for the creation of new boundary/adjustment, emanating from any group of people within Nigeria, will be approved by a referendum conducted within the area which such a demand is originated. Distinguished Senators of Biafraland which include Senator Ike Ekweremadu, Senator Ben Murray-Bruce, Senator David Mark, Senator Stella Oduah, Senator Theodore Orji, Senator Godswill Akpabio, etcetera, will engrave their names on gold if they can pull themselves together and galvanize as caucus Senators from Biafraland and sponsor a motion for Biafra referendum in the Nigerian Senate, disregarding the odds. Moving a motion for such a demand is a legislative obligation to the representatives of both the higher and lower chambers of the parliament, who primarily were elected by the people from both senatorial districts and federal constituencies. Biafraland is an area where predominant agitations for independence originated. Moving such a motion in the Nigerian Senate is a necessity that is aimed at attaining the status of “Legislative Obligation” to the Senators who are representing the region. This is because, such a demand has assumed a very dangerous precedence within the senatorial districts for over four good years now which the Nigerian government, has failed in it’s desperate bid to quell, through the instrumentality of military brutality and suppression, thereby orchestrating several loss of hundreds of lives. Biafrans have agitated, protested, picketed, rallied, carried out civil disobediences, suffered loss of precious lives and with thousands including women, extra-judicially detained, because of this demand for the restoration of the sovereignty of Biafra. However, to the greatest chagrin of the global community, no Senator or member of the House of Representatives of Biafra extraction, has deemed it worthy to conduct any constituency hearing or town hall meeting on this very issue. All the legislators have maintained sealed lips in both chambers of national legislature as if everything was okay back home. Now that the Directorate of State (DOS) of the Indigenous People of Biafra (IPOB) worldwide, on the mandate of the Biafran people, has very successfully petitioned virtually all the world governments and organisations and have put them well on notice pertaining the irrevocable demand of the people, to peacefully test the genuineness and popularity of the Biafra independence drive, it is expedient therefore that these Senators win back the respect and trust of their own people whom they claim to be representing in the Nigerian parliament. All the world governments have received the petition of the Biafran people as duly served through the office of IPOB Directorate of State in Lagenfield, Germany and are presently awaiting the Biafra referendum motion to be moved in the Nigerian parliament by the representing Senators and members of the House of Representatives from the Biafran territory. This is to enable them, release their own statements. It is on this premise, that these Biafran Senators should discard all victimization threats from the cabal-infested Nigerian government. If all these representatives from both chambers could courageously stand in synergy, sign and sponsor the motion for Biafra referendum, the Fulani oligarchy and cabals running the Nigerian government, will have no option than to conform. Moreover, taking such a bold step, IPOB family members of different departments, will be readily prepared more than ever, to sacrifice even their oe lives in defense of their Senators, should the Fulani oligarchy dare tries to victimize any of them. The Senators through this singular act of positive defiance, with attendant generational effects, will simply write their names in the annals of history. And even if the bill fails to scale through the first reading in both the Senate and House of Representatives, because of the domineering antecedents of the Northern politicians, the world will yet bear witness that they actually lived up to expectation. 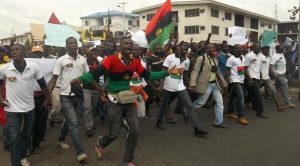 The IPOB/DOS petitioned governments of nations together with their diplomats, will then see the ground to openly step into the Biafra agitation. If these Biafran Senators are really representing their people, the need to move such a motion, remains a legislative obligation that must never ever be compromised. This is the only window left open to them to redeem their image. PreviousPrevious post:SHOULD BIAFRA SEPARATIST AGITATION BE SEEN AS AN DOMESTIC AFFAIR?NextNext post:One Nigeria: The Marriage Is Finished, A New Revolution Has Come!